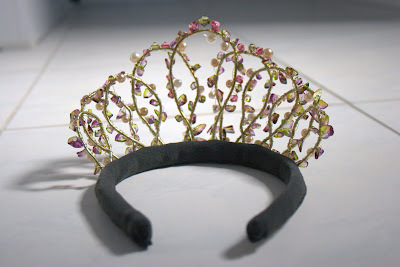 Here it is at long last, the fairy princess tiara I made for my niece Rylee. This is the very last item to be made for the whole fairy princess costume saga. I couldn’t believe how long it took me to finish this one, it’s been a work in progress for quite a while. 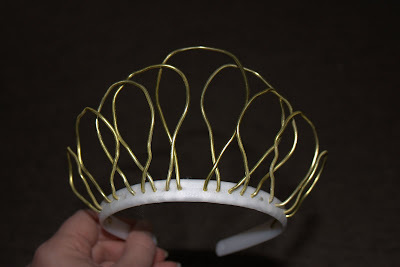 I got some wire that was thick and sturdy, but light, and threaded it through the head band holes, bending it into a tiara shape. 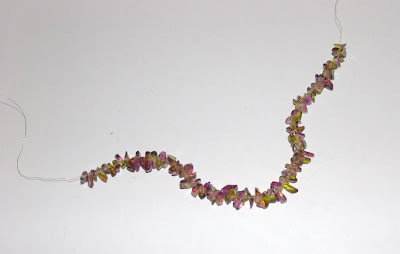 I recycled some glass beads from a broken necklace to thread onto some fine beading wire and wind around the thicker wire. 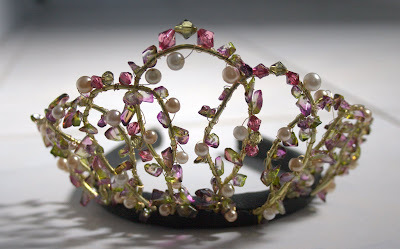 I have also used some old pearl beads of random size and colour, kept by my Nana in her bits and pieces collection, and a few green and dark pink faceted beads on the peaks. Lastly I covered the band with a bit of wadding and some fabric left over from the wrap and skirt to hide all the wire ends. Here I am wearing it, as I haven’t got a photo of it on Rylee just yet. 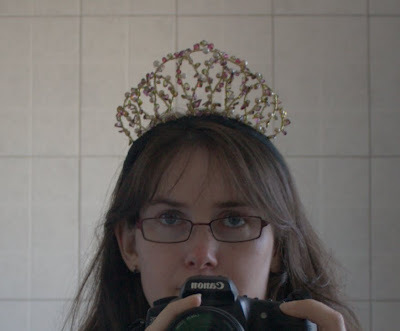 She did like it though, the first thing she said when she opened the gift was, “look, I got a crown!”.